My post yesterday about the band Bodies got me thinking a little more about guitarist and singer Mike Pollock. He’s a non-native Icelander, son of an American father and an Icelandic mother, who grew up in the United States and didn’t move to that island in the Atlantic until around the age of 20, but can still lay claim to having with many important Icelandic artists. His resume includes a stint with the Utangarðsmenn, Bodies, and Das Kapital, as well as playing with Iceland’s version of Bob Dylan, Megas. He’s prolific, to say the least, and I wanted to take another listen to his 1981 solo LP Take Me Back. It had admittedly been a while since I’d last spun this record, so honestly I wasn’t even sure what to expect – it was a lot like listening to it for the first time. And it really wasn’t what I was expecting at all. I thought it would be punk/post-punk/new wave… but to be honest it sounds a lot like a James Taylor record. And I don’t mean that in a bad way. Sure, a lot of people make fun of Taylor and act like they don’t like him, but I always thought he was super talented and had a perfect voice for the type of songs he does. Mike Pollock is cut from that same cloth. 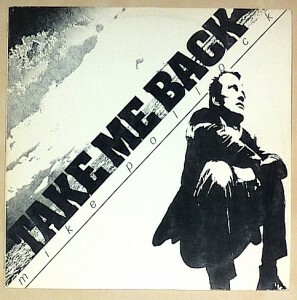 Sung in his native English, Take Me Back is a cool folk-rockish album, though Pollock’s inner punk sneaks out at times, most notably in the very post-punk sounding “What’s Real?” The bottom line is these are stripped down songs that feature Pollock’s guitar and voice front and center, exactly what a solo album should be. And another thing. The man can write. and he pulls down the shade. Take Me Back is populated by the heartbroken and the confused, the lovers and the losers. And Pollock’s voice telling their stories. This entry was posted in Iceland, Post-Punk and tagged Icelandic Music, Mike Pollock, Music, Take Me Back by Administrator. Bookmark the permalink.